Case studies – wrapping it all up! We are now at the very end of this module and I hope the module has given you a fair idea on understanding options. I’ve mentioned this earlier in the module, at this point I feel compelled to reiterate the same – options, unlike futures is not a straight forward instrument to understand. Options are multi dimensional instruments primarily because it has many market forces acting on it simultaneously, and this makes options a very difficult instrument to deal with. From my experience I’ve realized the only way to understand options is by regularly trading them, based on options theory logic. Either ways I’m happy because each of these trades has a logic backed by a mutli disciplinary approach. So in that sense it is very gratifying, and it certainly makes a perfect end to this module on Options Theory. Do note the traders were kind enough to oblige to my request to discuss their trades here, however upon their request I will refrain from identifying them. For each trade I will discuss what I like about it and what could have been better. Do note, all the snapshots presented here are taken by the traders themselves, I just specified the format in which I need these snapshots. The trade was executed by a 27 year old ‘Options newbie’. Apparently this was his first options trade ever. 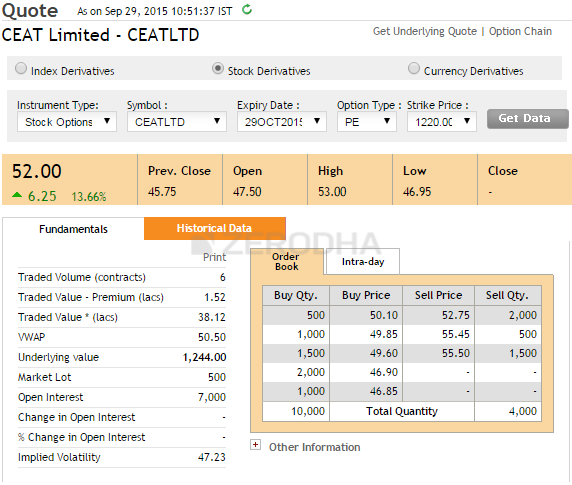 Here is his logic for the trade: CEAT Ltd was trading around Rs.1260/- per share. Clearly the stock has been in a good up trend. However he believed the rally would not continue as there was some sort of exhaustion in the rally. My thinking is that he was encouraged to believe so by looking at the last few candles, clearly the last three day’s trading range was diminishing. Why did you choose to trade options and not short futures? When there is so much time to expiry, why did I choose to trade a slightly OTM option and not really far OTM option? Since the stock is in a good up trend, the idea is to book profits as soon as it’s deemed suitable. Reversals can be sharp, so no point holding on to short trades. In fact it would not be a bad idea to reverse the trade and buy a call option. The trade is a play on appreciation in premium value. So I will certainly not look at holding this to expiry. Given that there is ample time to expiry, a small dip in stock price will lead to a decent appreciation in premium. Note – the QnA is reproduced in my own words, the idea here is to produce the gist and not the exact word to word conversation. Stock price declined to 1244, and the premium appreciated to 52/-. He was right when he said “since there is ample time to expiry, a small dip in the stock price will lead to a good increase in option premium”. He was happy with 7/- in profits (per lot) and hence he decided to close the trade. Looking back I guess this was probably a good move. Anyway, I guess this is not bad for a first time, overnight options trade. My thoughts on this trade – Firstly I need to appreciate this trader’s clarity of thought, more so considering this was his first options trade. If I were to set up a trade on this, I would have done this slightly differently. I find this a good setup to buy call options. This is a trade in Nifty Index options based on RBI’s monetary policy announcement. The trade was executed by a Varsity reader from Delhi. I considered this trade structured and well designed. Here is the background for this trade. RBI’s monetary policy is one of the most eagerly awaited events by the market participants as it tends to have a major impact on market’s direction. While, I cannot vouch for his first observations, the 2nd and 3rd observation does make sense. So in the backdrop of RBI’s policy announcement, ample time value, and increased volatility (see image below) he decided to write options on 28th of September. Nifty was somewhere around 7780, hence the strike 7800 was the ATM option. The 7800 CE was trading at 203 and the 7800 PE was trading at 176, both of which he wrote and collected a combined premium of Rs.379/-. Here is the option chain showing the option prices. Why are you shorting 7800 CE and 7800 PE? Why did you choose to short ATM option? There is a high probability that I would place market orders at the time of exit, given this I want to ensure that the loss due to impact cost is minimized. ATM options have lesser impact cost, therefore it was a natural choice. For how long do you plan to hold the trade? Volatility usually drops as we approach the announcement time. From empirical observation I believe that the best time to square of these kinds of trade would be minutes before the announcement. RBI is expected to make the announcement around 11:00 AM on September29th; hence I plan to square off the trade by 10:50 AM. What kind of profits do you expect for this trade? I expect around 10 – 15 points profits per lot for this trade. What is you stop loss for this trade? Since the trade is a play on volatility, its best to place SL based on Volatility and not really on the option premiums. Besides this trade comes with a predefined ‘time based stoploss’ – remember no matter what happens, the idea is to get out minutes before RBI makes the announcement. So with these thoughts, he initiated the trade. 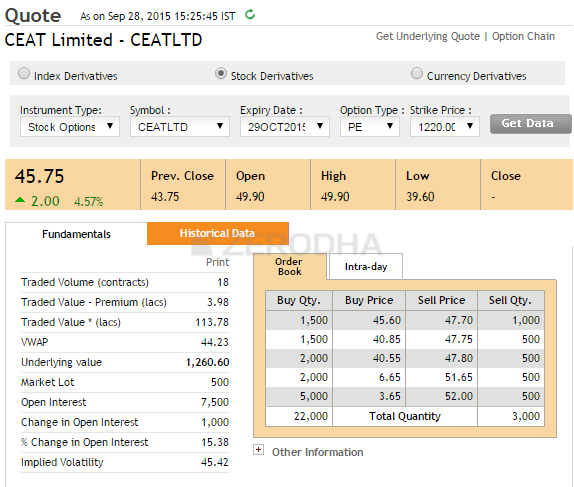 To be honest, I was more confident about the success of this trade compared to the previous trade on CEAT. To a large extent I attribute the success of CEAT trade to luck, but this one seemed like a more rational set up. Anyway, as per plan the next day he did manage to close the trade minutes before RBI could make the policy announcement. As expected the volatility dropped and both the options lost some value. The 7800 CE was trading at 191 and the 7800 PE was trading at 178. The combined premium value was at 369, and he did manage to make a quick 10 point profit per lot on this trade. Not too bad for an overnight trade I suppose. Just to give you a perspective – this is what happened immediately after the news hit the market. My thoughts on this trade – In general I do subscribe to the theory of volatility movement and shorting options before major market events. However such trades are to be executed couple of days before the event and not 1 day before. Let me take this opportunity to clear one misconception with respect to the news/announcement based option trades. Many traders I know usually set up the opposite trade i.e buy both Call and Put option before major events. This strategy is also called the “Long Straddle”. The thought process with a long straddle is straight forward – after the announcement the market is bound to move, based on the direction of the market movement either Call or Put options will make money. Given this the idea is simple – hold the option which is making money and square off the option that is making a loss. While this may seem like a perfectly logical and intuitive trade, what people usually miss out is the impact of volatility. When the news hits the market, the market would certainly move. For example if the news is good, the Call options will definitely move. However more often than not the speed at which the Put option premium will lose value is faster than the speed at which the call option premium would gain value. Hence you will end up losing more money on the Put option and make less money on Call option. For this reasons I believe selling options before an event to be more meaningful. This trade is very similar to the previous RBI trade but better executed. The trade was executed by another Delhiite. Infosys was expected to announce their Q2 results on 12th October. The idea was simple – news drives volatility up, so short options with an expectation that you can buy it back when the volatility cools off. The trade was well planned and the position was initiated on 8th Oct – 4 days prior to the event. Infosys was trading close to Rs.1142/- per share, so he decided to go ahead with the 1140 strike (ATM). 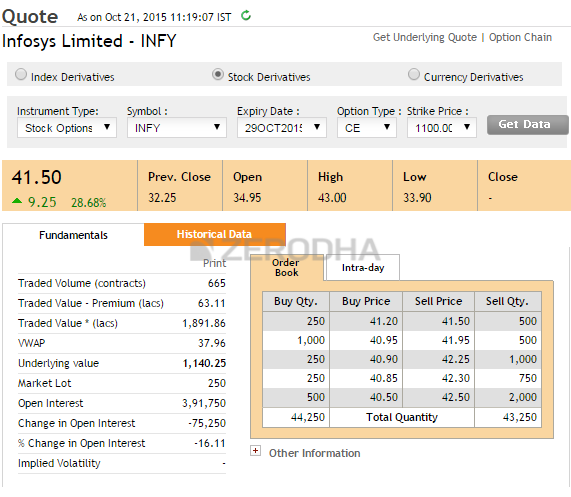 On 8th October around 10:35 AM the 1140 CE was trading at 48/- and the implied volatility was at 40.26%. The 1140 PE was trading at 47/- and the implied volatility was at 48%. The combined premium received was 95 per lot. I repeated the same set of question (asked during the earlier RBI trade) and the answers received were very similar. For this reason I will skip posting the question and answer extract here. “For the July-September quarter, Infosys posted a net profit of $519 million, compared with $511 million in the year-ago period. Revenue jumped 8.7 % to $2.39 billion. On a sequential basis, revenue grew 6%, comfortably eclipsing market expectations of 4-4.5% growth. In rupee terms, net profit rose 9.8% to Rs.3398 crore on revenue of Rs. 15,635 crore, which was up 17.2% from last year”. Source: Economic Times. The announcement came in around 9:18 AM, 3 minutes after the market opened, and this trader did manage to close the trade around the same time. The 1140 CE was trading at 55/- and the implied volatility had dropped to 28%. The 1140 PE was trading at 20/- and the implied volatility had dropped to 40%. Do pay attention to this – the speed at which the call option shot up was lesser than the speed at which the Put option dropped its value. The combined premium was 75 per lot, and he made a 20 point profit per lot. My thoughts on this trade – I do believe this trader comes with some experience; it is quite evident with the trade’s structure. If I were to execute this trade I would probably do something very similar. This trade was executed by a fellow Bangalorean. I know him personally. He comes with impressive fundamental analysis skills. He has now started experimenting with options with the intention of identifying option trading opportunities backed by his fundamental analysis skills. It would certainly be interesting to track his story going forward. Infosys had just announced an extremely good set of numbers but the stock was down 5% or so on 12th Oct and about 1% on 13th Oct. Upon further research, he realize that the stock was down because Infosys cut down their revenue guidance. Slashing down the revenue guidance is a very realistic assessment of business, and he believed that the market had already factored this. However the stock going down by 6% was not really the kind of reaction you would expect even after markets factoring in the news. He believed that the market participants had clearly over reacted to guidance value, so much so that the market failed to see through the positive side of the results. His belief – if you simultaneously present the markets good news and bad news, market always reacts to bad news first. This was exactly what was going on in Infosys. He decided to go long on a call option with an expectation that the market will eventually wake up and react to the Q2 results. He decided to buy Infosys’s 1100 CE at 18.9/- which was slightly OTM. He planned to hold the trade till the 1100 strike transforms to ITM. He was prepared to risk Rs.8.9/- on this trade, which meant that if the premium dropped to Rs.10, he would be getting out of the trade taking a loss. After executing the trade, the stock did bounce back and he got an opportunity to close the trade on 21st Oct.
Do realize the entire logic for the trade was developed using simple understanding of financial statements, business fundamentals, and options theory. My thoughts on this trade – Personally I would not be very uncomfortable initiating naked trades. Besides in this particular while the entry was backed by logic, the exit, and stoploss weren’t. Also, since there was ample time to expiry the trader could have risked with slightly more OTM options. And with this my friends, we are at the end of this module on Options Theory! I hope you found this material useful and I really hope this makes a positive impact on your options trading techniques. I will be grateful if you check & confirm whether working is properly done or not. Dhansukh – can you put up the step by step calculation? It would be easier for me to check. Thanks. I read all your modules on options and I must thank you for such a great explanation, you are so gooooood at teaching, cant appreciate enough! suppose, one has to do long nifty strangles which are OTM, and put price is 20 and call price 4, so still one should go buy equal no. of lots ? or divide amount in 2 and allocate for puts & calls equally? or use counter-proportionality…like 1/5th amt for put – 20 rs and remaining 4/5th amt. for 4rs call? Yes, markets are full of opportunities, you just need an eye to spot them. Yes it does make sense. However before you initiate such trades I would advise you to paper trade for sometime. Thanks. Please go through the following article in my blog, the strategy has given about 10% return in 2 trading sessions. Really good strategic examples. It shows more light on our trading mistakes. Please give some more strategic examples. Sir, does it make sense to buy ATM strike options (both) before the events before volatility shoots up? (Given that there is ample time to expiry). I personally observed premiums going up on trading sessions before state election exit polls few days ago. Yes, but you will have to time this very well, else you’d be buying at very high premium valuations. Thank you Sir, I observed that carrying positions overnight can lead to a loss, we have to buy and sell in intraday on the day before. Not true, Palash. To carry a position overnight or close within the day really depends on your risk appetite. Try here – http://www.nseindia.com/products/content/derivatives/equities/historical_fo.htm . Else you could even talk to NSE directly. NSE dose not provide geniue data. 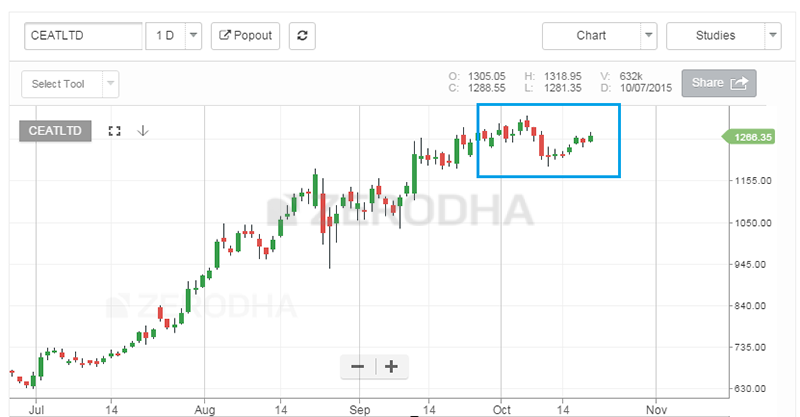 Is zerodha provides historical tick by tick data of options for new learners ? What makes you think that NSE does not provide accurate data? Thanks a lot for the wonderful module. Please convert then to PDF document , so that we can download and learn them offline. Working on it, should be available soon. Thank you so much for educating us. You are such a fantastic teacher. You have hooked me to varsity. Waiting for next module eagerly. sir,v.good hopefully these education ideas will change my trading&life dramatically,i learnt lot from u &big thanks deep from heart &moreoverdaybyday iam becomming so confident that by learning so much iam seeing mkts lot more easier&want to do it in big way,and why dont we get pivot points (pi)in commodities charts,clarify. Good Narsimha, I hope your trades improve and starts yielding better and better results. I donot find words to convey my gratitude towards your efforts…..God bless you…keep it up…!!!! Efforts are excellent.Read books from US libraries and websites and my understanding got cleared after reading yours. Your efforts in book form and in YouTube can benefit lot of retail investors.Those who can bent upon collecting money. Looking for your advise to get info on implied and historical volatility on scrips in chart form to use it in trading. Heiken ashi candlestick charts provide better buy sell signals. If kartik sir can explain this concept as he has done other complex topics it would b really helpful..thanks again.. I have a query.How do i know whether the volatility of a particular contract is normal or high…i mean above what number is volatility considered high and at what number,volatility is considered normal. Calculate the historical volatility and compare it today’s volatility. This should give you a perspective. Karthik, can we compare the option contracts IV to the IndiaVIX? More importantly, which is a better way to do comparison; Historical NIFTY returns or INDIA VIX. Waiting for your inputs!! For a quick and dirty analysis you can compare the IVs to ViX….especially for the top 5 stock options. A better approach would be to compare the historical volatility to IVs. Sir please tell me where can I find exact time of result on the result day for a particular stock. Working on it, may take a bit longer than usual as the module is quite big. If using Chrome, Ctrl+P converts web page into PDF.You might be aware of i,just saying it. As you have completed the module on OPTIONS THEORY please upload the pdf file then.it is easier to read as pdf. thank you. I think in the statement below the prices and profit made should be per share and not the per lot. Thanks for pointing this, will make the necessary corrections. You need to check out https://kite.zerodha.com/ its probably the best TA + execution platform in India…and yes, its free as long as you have a trading account with Zerodha. Thank you Sir. But is there any source other than Zeredha Kite? Suggest you check with http://neotradeanalytics.com/ for data. Also, have you checked Pi? Thank you! Looking forward to start trading with Zerodha. Also Sir, what are the requirements to use Pi, Kite & many such systems being a Zerodha trader? In sometime, we are working on it . Have a bit of a doubt. Even though the strategy is delta neutral when it is entered into, it might not necessarily be delta neutral in the next few days because of the effect of Gamma, right? Not really…in fact always add up the deltas…if its 0, then you have a delta neutral strategy. Sir can you please explain delta neutral strategy in next module…. I mean it is explained on lots of websites and forums but after entering the trade in delta neutral strategy we have to make adjustments to keep the delta neutral so what all things should one keep in mind while making delta neutral and how often…. Of course, we will. Please stay tuned. Thanks. This has response to Prince “Karnatakabank15NovFeature” means 2015Nov. It is not the date. It’s year. Thanks for the quick reply…. Really hats..off to your work … You are amazing … With lots of work i have hardly seen anyone on any forum replying to qweries so quickly…. This shows why zerodha is the best… Great people make a great company…? Sorry, cant really understand your query. Can you please be more specific? Please do have a SL and tgt in perspective and let the trade evolve, this is the best way to go about. How many chapters will be there in the next module? I mean to say, how many days will be required to know everything about option strategy? Not sure sir. Plan to have a chapter for each strategy. For example “bull call spread” will be 1 chapter. Idea is to cover as many strategies as possible. One chapter for one strategy will be a great deal. Sir, can you now it self tell something about following situation? Suppose you buy 1 lot in future but it turn out to be not in favour and it price goes down. What are the salvaging choices available. Shorting CEs or Long on PEs or long on next month future? I know it is too early to ask but just one sentence answer if possible. Hans – best bet would be either buy a PE (assuming there is ample time to expiry) or short the next month futures. Sir, Why do you say that selling PE will be havoc? If i am shorting the option then we have to square off the same day or we can carry forward the position overnight? You could carry forward the position, no issues with that! When will be the trailer for next module will be released:) ? My doubt is regarding time frame in option day trading for nifty at the money and slightly out of the money options which is better 5 min, 10 min or else? I am using technical indicator and chart patterns to take call on buying put or call. Rahul – please do not look at intraday charts for trading. Ideas have to be generated beyond chart patterns just like the way these traders have showcased their trades. Hello Karthik, Very nice article. It really helped a lot for people like me. However you are suggesting not to follow technical chart? (I am referring above your answer. If so what is the next step to become a successful option day trader? Yes, looking at charts for Options trading is not really a great idea. You should ideally analyse the spot and take action in either futures or options segment. 1.In the case study 23.4 Infosys Q2 Result, the 1140 PE IV dropped to only 40% from 48%. Was it because the market perceived the spot to go down? 2.And in the immediately previous case you have mentioned that the Put looses value at a faster rate than the Call in case of an upside. Although OTM Put will have a lower Delta and the ITM Call will have a higher delta. I think I am missing something. Please help. 1) Volatility dropped because the outcome of the event was out and there were no more surprises pertaining to the stock. 2) This should be taken in a more generic sense – one option gains faster in premium value than the one the other one losing premium value. Which one gains and loses depends on the outcome and therefore the direction. Thanks so much Darshan. Wishing you and your family the same! Have a great Deepavali. Wishing all Zerodha family and Varsity A Happy and Prosperous Deepawali 2015 and the year ahead. Thanks you so much Hans – Wishing you and your family the same! Have a great Deepavali. 1) what IV is consider high & low for currency ? 2) if the dollar falls by 10 paise (0.1) [I LOSE 100rs. ] & if the dollar gains 10 paise (0.1) [ i gain 100 rs. ] …. simple futures trade . a) delta = 0.007 …. WHAT WOULD HAPPEN IF DOLLAR FALLS BY 10 PAISE OR RISES BY 10 PAISE ? b) THETA = – 0.001 ….. WHAT WOULD HAPPEN IF DOLLAR FALLS BY 10 PAISE OR RISES BY 10 PAISE ? c) RHO = 0.000 …… WHAT WOULD HAPPEN IF DOLLAR FALLS BY 10 PAISE OR RISES BY 10 PAISE ? d) GAMMA = 0.0161 …… WHAT WOULD HAPPEN IF DOLLAR FALLS BY 10 PAISE OR RISES BY 10 PAISE ? e) VEGA = 0.003 ….. WHAT WOULD HAPPEN IF DOLLAR FALLS BY 10 PAISE OR RISES BY 10 PAISE ? 3) for a newbie options trader will index options be better or currency options ? 3) The premium would move at the rate of 0.007 paise for every tick movement…likewise for all the other Greeks. For a newbie trader currency options is certainly not advisable. Please do stick to regular index options till you get accustomed to derivatives. how can i get get information related to major upcoming events for nifty a few days earlier to develop my my strategy for event???? The best way is to keep track of news and day to day developments. Although for US/UK markets there is an ‘economic calendar’ which helps you track this…nothing like this exists in India yet. The next major events are RBI policy on Dec 2 and FMOC meet on Dec 15, 16..
Will these events impact more on India VIX? In Chrome, Ctrl+P converts web page into PDF file.I converted all chapters in the same way. I think better not to trade before results.The outcome can be like exit polls of TV channels.Go horribly wrong. Recent Infy results was best example. When we are getting this in PDF.. Sir.. I would like to add another sentence in your appreciation for presenting the complex subject which a person with little knowledge of mathematics can understand and make use in real life. Carry on with the good work. The module on ‘Option Strategy’ is showing a placard ‘Coming Soon’ for quite sometime now. When can we expect to get that? In Nifty options, does increase/decrease of volume (contracts) traded has any significance,if so how? In NSE site top 20 contracts traded, I was trying to understand, if a contract is in top, does it mean the premium is going to increase or decrease? To some extent it does. In fact will be discussing a strategy called Max Pain, this should give you a sense of how you could use this info. None that I know..but you can always considering writing your queries here on Varsity! Will be more than happy to respond to them. I am new and unable to use your Option Calculator.Where from I get Interest and Volatility ? The explanation provided by the author is simply amazing! There is so much value in the explanation provided in these chapters. One can easily charge 10-15k for it. I sincerely appreciate your hard work, effort, and urge to explain the subject from layman’s perspective. Great work! Thanks Abhay, glad you liked the content! 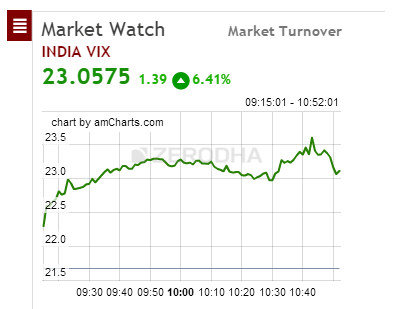 Before the major events(like RBI Policy, election results), will it be prudent to directly short india vix index before the event when india vix shoots up, or it will be more safer to short atm calls and puts of nifty and book profits after the event when volatility cools down? What about strike selection? If I am sure that the volatility will drop, what should be the ideal strikes that should be selected for maximum profits? Will ATM strikes gives maximum profits? Sumeet, please check section 19.2 – http://zerodha.com/varsity/chapter/vega/ for some pointers on this. Eventhough, I am trading options for 2 years, it was Re-learning(refreshing) experience for Me. I really appreciate the Effort you put in to Zerodha Varsity. It’s awesome n every chapter is explained as simple as possible with examples. Truly, Zerodha is a Class Apart. For that Ceat example, it comes out to be- -45.75,then how’s he making 7 ? Is P&L change in premium or the formula I just mentioned above? Please don’t laugh at me, I’m a novice in options world. Shailey – pls dont worry, you can ask as many questions as possible. The P&L formula you stated is true only if the option is held till expiry. Otherwise you just take the difference between the premiums (buying value minus selling selling value). If you do that for CEAT you will get the answer as 7. Thanks alot sir, you’re such a nice person. pls… karthik sir combined all this chapters into a single Downloadable PDF file as you did with previous modules. I would like to know more about Option OI (Open Interest). How is significant in finding resistance and support levels? Please throw some light on it. If you have any book in mind which would help in understanding the concept please let me know. Would be happy to go through that. Could you please reply to my above queries? Gautam – I don’t see any query from you. Can you please post it again. Thanks. Replied to your other query! With the drop in Volatility the premium drops — this is the effect of vega on the premium. At the same time if the underlying also moves then there is the effect of delta. So this can clearly increase the premium. Plz explain what is Put Call Ratio? How can We use it to predict market trend and how to calculate it? Is it really useful ? If yes then you can make a separate chapter on them. thanks..
Will make a separate chapter on this in the on going module. Eagerly waiting for the same……. Yes you can book profits, you need not have to hold the position till expiry! All Call option about 66.37 is considered OTM, including 66.5. Hence the 66.5 CE expiring worthless is justified. However the 66 and 65.5 option has an intrinsic value, not sure why NSE is is suggesting the settlement is ‘0’. Also, just for your information…. the options derives its value from the RBI reference rate (Spot price) and not futures price….but since its the expiry date both futures and underlying would be the same. Need to dig up a bit further to figure out why the settlement is 0 for ITM options. As mentioned in the CEAT eg u would have preferred to sell the call option and also not on single side..Is it selling slightly otm/Atm and buying the same month ext otm call(strike next to the shorted call) to take the advantage of consolidation or down trend movement? If so if the share moves continuously in the uptrend and it may end up in loss like ext otm becomes zero and slightly otm may end up as itm. Kindly clarify the thought behind your view..
Vasanth – I was referring to selling naked calls here, although it is not my first choice. I would be happy with spread positions as explained in module 6. With the entire view of options theory can I use the ta in underlying chart and taking position in ATM/Itm options is the fair thought? Because in the comments you have mentioned that options is not direct instrument like futures to play the intraday trading..with the use of Greeks and mix of ta the trades can be executed? Yes you can use TA to develop a sense on whats happening in the stock and initiate trades using options. Do not restrict yourself to ITM/ATM…rather select strikes based on the situation. so 1280PE is ITM still all colums in nse site are empty. means no trading . just wondering why? Hmm, looks like no liquidity. If the contract remains deep ITM then you will have to bear the losses. Of course you will not be able to buy it, but exchange will intervene and cash settle it for you. sir what will happen on expiry if i Sell Deep OTM call which has no liquidity….i will be in profit …??? No, the option will be exercised as per its intrinsic value, hence you would be under a loss. Then this will be a very high loss? . For example if Nifty at 8000 and I wrote 10,000 call which has no liquidity, how much loss would be there? one suggestion, pls forward everyone reply to their email id, I asked a question somewhere but not able to find it now. Loss would be 2000 times lot size. Will check if that is possible. Thanks. hi karthik , i notice that these todays usd inr option premium very cheap, same case in nifty option, please explain why>? Over the last few days the volatility is on the lower end, and perhaps this is the reason for low premiums. It would be very great if you could share more strategies executed by you or fellow traders. They will give practical insight and will be eye opener. Also, can you please suggest some good books for reading on Options/ Strategies or related, which are more practical in sense. Currently I am reading Traders, Guns and Money as found it mentioned. It’s a awesome book and has real life swap trade conundrums. Will try and add some more strategies, thanks! Thanks for all the information and knowledge sharing. Making videos consume a lot of time, we consciously stayed away from it :)….but we will certainly give it another thought. Thanks for suggesting anyway. Cant really point to one, you need a combination of everything! sir, in margin calculator bank nifty option for sell , which is weekly expiry basis is not updated,provide this asap, contacting 080-40402020 they are telling that margin is same as monthly expiry, which is not true!!! Margin is a function of risk therefore I’m assuming the margins are similar. Let me check anyway. Can we get a list of liquid stock options in NSE? As far as I know the top 5-7 names have the best liquidity – TCS, Infy, SBIN, Reliance, Tata Motors, Hindlaco, ICIC etc. I was looking for a list of 20-30stocks which have best liquidity in Options Market. Can you provide with any such list? I tried searching at various sites, but was not able to find one comprehensive list. Your best bet would be to stick to the top 20 in the Nifty 50 basket. Sir in the example of Infosys q2 results , the person could have made 40 points if he shorted slightly OTM and infy is a liquid stock . What was his reason for going for ATM option ? Perhaps he wanted to hedge the position and simultaneously take advantage of high volatility. can we depends on options fair value calucultor for taking a position,for eg-if today 8700 calls fair value was 124 in morning,it went up to 145 and once it was in 92 intraday and closed it at 114,if it trade below 20% than fair value can we take a 8700 call buy? or any other technical tools can we mix to arrive our trade for using fair value? or how logical can we put stop loss in fairvalue dependent trade? or its a wrong method? There is absolutely nothing wrong with this strategy. The only issue is that most liquid options trade at fair value, hence it is really hard to find opportunities. Hi Karthik. I have a doubt regarding the weekly bank nifty options. I understand that the monthly options follow the particular month’s futures, and not the spot. What do the weekly options follow? Today, when market ended at 18571 (spot), the value of the 18500CE (Aug04 expiry) was 70 and the value of the 18700PE was 105. It just doesn’t add up. Another related doubt: the market actually ended at 18627; and then after close, it adjusted to 18571. This adjustment happens everyday. What is the rationale behind this adjustment? All derivative contracts follow the underlying in the spot market. The premiums look fine for me, what do you think it does not add up? 18627 is the last traded price, and 18571 is the closing price. The closing price is the last 30 minute weighted average price. When the market ended between 18500 and and 18700, should the premiums for the 18500CE and the 18700PE add up to 200? It’s only adding up to 175 (70 + 105). It will add upto 200, on expiry day. It can be otherwise when before expiry. Yesterday was the expiry. This is about the weekly bank nifty options. The options I mentioned in my question are options that were slated to expire on August 4th. It didn’t add up to a premium of 200 yesterday. It only added up to 175. Yes, they should add up at least on the day of expiry, else there could be an opportunity. But are you sure you checked the closing price (settlement price) and not just the last traded price? Oh, I didn’t realize the settlement price could be different from the last traded price. I was doing paper trading on a strategy I’m working on, and the calculations based on the last traded price on the weekly expiry date left me confused. Thanks for clearing this up, Karthik! Great effort put into making these resources. I thank both, the writer and Zerodha, for disseminating knowledge so clearly and efficiently. Looking forward to reading and understanding more in your other modules. I have studied and tried to apply what I learnt from your module on options for the past two months. For the first month I hadn’t made any money (lost all what I made, though did secure my principal amount), but learnt a lot after ‘doing’ it practically on trading platform. But then, I made around 20% profit in the 29SEPT2016 series, and I wouldn’t be able to do it without THIS module! Also learnt from the mistakes I did. Thank you SO much for sharing such wonderful tool on Varsity – For all I have been successful in F&O the credit goes to YOU! I’m so happy to know this. I hope you get more successful and profitable. Good luck. Hi I have a question regarding option trading. Assume I have 2 lac of capital, which I have totally invested in equity stocks. I have no more capital now. Can I simultaneously write nifty call or put options using my equity stocks as security? Can the margin for options be used across my equity stocks? Assume I have invested my money in large cap stocks . Please suggest what all check points we need to consider for nifty options intraday. In the second case-study ie Nifty- Delta neutral strategy, why it is square off the position just before the RBI announcement? What would have happened that person had opted to square-off just after the announcement? Because what I’m thinking is that volatility would be lower after the announcement compared with before the announce. RBI announcement is an event. The rational is that volatility runs up to the event and cools off post event. So it makes sense to close the trade before the volatility cools off. Yeah, I have understood. In the example above, by observing the given graph after the announcement, what would have happened if that person had opted to square-off just after the announcement? I’d guess he would make a lesser profit. Where can we see the implied volatility chart for stocks and bank nifty, to decide if the Volatility is high or low. For e.g. like we have India VIX to decide implied volatility levels for Nifty, where do we check the historical values for bank nifty and stocks ? I am aware of this link. But it shows the value of IV in real time. What if I want to see historical values, to decide if the current value is high or low. Like to initiate a new trade on say Maruti, I need to look at historical values of IV to decide if the current value is high or low… where can I get the historical IV data…. Today’s Implied Volatility of SunTV is 34.52 for 900 CE (Nov series, 2017). Should I compare Annualized volatility of 52.07% with 34.52 (as of today, as per NSE). If yes, than can I presume IV is less than HV and one can look at buying option, keeping other factors in mind. Dipankar, although not a great way, serves as a good back of the envelope technique to compare today’s vol versus historical. I end up doing this myself. In continuation, than what is your suggestion is the best way to estimate whether today’s IV is cheaper/costlier than Historical values? I am not able to decide on taking trades because of this costly/ cheap/fair value query in my mind. Pls suggest. Also is NSE IV numbers based on past 1 year data. Valid question Dipankar. The most accurate way is to compare today’s IV, when its let’s say 5 days to expiry versus the IV of past when the expiry is 5 days. However, doing this is not really easy…and comparing historical versus today’s IV gives roughly the same kind of results. Hence I go with it. iBook link is corrupted ,it would great if you can kindly fix it .Thank you ! Thanks for pointing, I’ll check this right away. more OTM options.” Can you elaborate on why would you go with more OTM. Change in premium would be more for slightly OTM option right? due to higher delta. (Assuming he is very confident of the directional trade). Both these conditions favored the case, hence I thought slightly OTM would be better. Thanks Karthik for the wonderful insights!! I have a few queries on the trades. 1. In CEAT example, what would be the ideal strike price to choose in case I decide to write a call option instead of longing a OTM put. I went through your earlier chapters and quite clear on buying logic wrt to time to expire. From logic, I believe it would be ideal to short an ITM call for its high delta changes. Please validate. 2. In 2nd example, I am not very much clear on the explanation for shorting ATM strikes. Please clarify. Hope u cud lighten up a few things over here again. 2) Can you tell me which bit you are confused with? “There is a high probability that I would place market orders at the time of exit, given this I want to ensure that the loss due to impact cost is minimized. ATM options have lesser impact cost, therefore it was a natural choice.” Not very much clear about impact cost. If I square off at day 2 then what will be my p&l? You will make a profit of Rs.10 i,e 110-100. This is excellent stuff. people usually charge to give this kind of information. great job. I am newbie in FnO . I felt there could have been some more examples of trades for PUT option and CALL Option . I have two trades and lot of confusion. 1 – I bought , Tatamotors 30 MAR 480CE @9Rs Premium on 27FEB, when spot price was 455. I know I should have sold the CALL option. Instead I bought it. I have tons of time in OTM call, but I see the MTM is calculated for this option . meaning everyday Price difference is added or taken as M2M. – This way I am incurring tons of losses. if I make profit after 15day or 20days … everyday , M2M in Options trading is killing me. I tried to reach your support center with no luck. Exiting the position will cause more losses . – IS there an M2M for OPTIONS trading. if yes, could you write post with example explaining this one. – I do not see MTM is calculated based on daily upmoves. * This is very confusing to what I am reading and what I am seeing in practical. Any thoughts what is happening here !! No, there is no M2M as such. However, with declining premium, the value of your option also declines, which in a sense is a loss. Remember, M2M is only for Futures and not options. With this information, I’d request you to review your current situation, I’m certain a lot of things will clear up. 3. Say I am writing a CE and also I am buy a CE at a different strike. Assume the total margin required is 95k (post margin benefit of say 10k). I have 1 lakh in my account. How do I execute this trade? 3) Execute as two separate trades, once the 2nd trade is complete, system will identify the spread benefit if any and give the benefits. I recently join zerodha . I went through this chapter , but have some confusion. say, I bought INFRATEL company call 300 by paying premium 15 RS. after some days call 300 premium increased 20 RS . At this stage can i book profit by earning 5 Rs./share before expiry date. Yes Sir, you can. No need to wait till expiry. i am excitingly waiting for this ansewer! If you are trading with Zerodha, then it would be a flat fee of Rs.20/-. and what about other charges i.e service tax, stt, etc . It would be on underlined value or on premium value. Service tax is applicable over the brokerage charge. STT is on the turnover. i recently joined zerodha and buy option call 530 of gail on 7 march 2017 .Now on 9 march 2017 there is ex-bonus date and i think share prices will down because 3 share becomes 4 shares as bonus in ratio 1:3 . Now what will happen? can i have to face huge loss due to this? No, you will not face any loss owing to any corporate action. The contracts will be adjusted accordingly. Why did you choose to short ATM option? There is a high probability that I would place market orders at the time of exit, given this I want to ensure that the loss due to impact cost is minimized. ATM options have lesser impact cost, therefore it was a natural choice. …….Here what does the impact cost mean? Nifty as such has a very low impact cost, so you need not have to worry about losing money owing to impact cost. Earlier, you said options in India are of European type and hence one cannot exit their positions until expiry. But at places you’ve said people profiting from the increase in premiums. I don’t understand. Can I exit options just like future, anytime I like/wish? One can exit the option positions anytime he wants, but he can exercise the option only on the day of expiry. There is a difference between the exercising the option and squaring off the position. Just sharing my first Options trade.. Need your valuable guidance. Well keeping the UP Elections in mind, I decide to trade a Short Strangle on Nifty. But on the date of executing the trade I realized that the OTM premiums have already been depreciating a lot anticipating the Exit Polls. So I tweaked my strategy a little bit and went on to adopt Short Straddle as the Volatility has not depreciated that much( the effect of Volatility is greater for OTM options as per my knwledge). As per my understanding the Volatility will still drop in the course of time after results get decalred. Now is the point where I messed up a little. 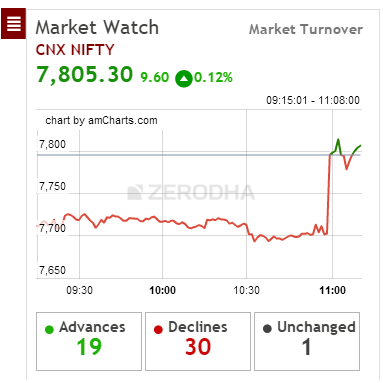 Nifty at the EOD was around 8934. I know that as I have sold the 8950 CE I should retain the whole premium. But in the MTM p/L section for this option was showing some other value. And to square off the positon I had to buy it at some value. Same was with PE options.. I basically got very confused. Like my question is like if I am selling a Call option at 100 for rs.20. then only if i let the options expire under 100 then I will pocket the whole premium.. Otherwise if have to close my positon(square off ??) before expiry I have to buy it back..
Also we have to not let the Exchange square off our position as it leads to STT (taxes). Well thanks to Zerodha things like Options, Call, Put , IV are not alien to me anymore. Please let me know what I have wrote regardiing Squaring off and Expiry is correct or not. Btw, after all this goof up I still managed to make a small profit :). So now if ABD is trading at 480 and I exercise the options I will earn the whole 66 prmium from CE and 55 from the PE options. Also, the same above position of ABD can also be squared off if I wish, like when ABD is trading at 480, note what premium 500 ce and pe are trading, square off and take p/l applicable..
Hope for your kind guidance. Individual securities were American in nature previously. Now all options in India are European. Well, I’m happy to know you garnered the courage to short a straddle (btw, its short straddle not short strangle). This is probably the right strategy for the given circumstance in the market. When you short options and collect premiums, you are entitled for the whole premium only if you manage to hold till expiry. However, if you wish to close the trade before hand, then its not a problem. Assuming it has moved in the right direction, you will make a smaller portion of the premium and not the entire premium. I have a feeling that the premium will drop by around 9:30 – 9:45 ish…. (just after the event is over), I’m not tracking the options…but if you do, please do let us know how it went. Good luck. Is it correct or I’m missing something and If possible could you please write the formula? Ravinder, your P&L will be the difference in the premiums…i.e (premium at the time of sell – premium paid) * lot size. In your case 107-90 = 17. 17*75 = 1275. So does it mean that spot price has no affect on the P&L in this case. It will always be premium gain/loss * lot size? It seems that premium gain is not in the picture. Right? Could you please clarify the same? This formula – P&L = Max [0, (Spot Price – Strike Price)] – Premium Paid , is applicable if you hold the position to expiry. However, if you decide to sell it before expiry, then P&L is just the difference between the premiums multiplied by lot size. The premium is in turn dependent on spot price! First things first. Thank you very much for the Lessons . I was trading in cash only for last 4-5 years and seen good and mostly bad days. soon I shifted to zerodha, I started learning Futures and option since last one and half month. the kind of knowledge i gained clearly visible in my trading style when 80% profit calls and 20% mostly triggered by the stop losses. I wished I found your courses 4 yrs ago ,i would have been a HNI by now. Neverthless In recent rally your lessons bought me great fortunes and profound confidence . Thanks for the kind words, Manju. Hope your trades get bigger and better. Good luck. i love to read all the articles in varsity, this has changed my perspective about market and trading. thanks for giving knowledge. as i am really inspired by you , i have some personal question if you wish to answer? what is your educational back ground?, what inspire you to venture in to market ? how did you start? Thanks for the kind words, Kaushik. 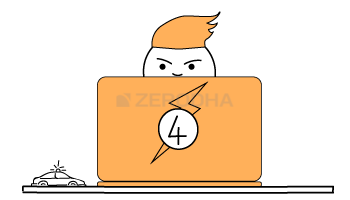 You may not believe it, at Zerodha we genuinely love to share what we know and help others. Knowing other will benefit from without any cost associated to it keeps us motivated all the time. Its just that I’ve been lucky enough to deliver the content via this medium. I’ve done my engineering from RVCE, Bangalore followed by a MSc in Risk and Asset Management from EDHEC, France. Could you elaborate on how to set the stop losses for options? You have explained in one of the modules to set the stop loss as a function of the volatility, same calculated on the basis of the days to expiry. But there you had indicated that this method can be done for futures and stocks. Say the SD is calculated at 3%. which would mean that the stoploss for the underlying would be at 3% lower than the Entry Price (for a Long call). If the 3% translates to an absolute value of 50 points, then depending upon the moneyness of the strike , I calculate the probable loss in premium by multiplying 50 with the corresponding delta of the option. The stop loss for the CE would then be set at the entry premium less the value calculated in the previous statement. Sure. You can explore this SL technique. Nothing wrong with it. Regarding a statement in Case 1 : “since there is ample time to expiry, a small dip in the stock price will lead to a good increase in option premium” – could not understand the essence of this statement. The trader had bought a slight OTM PE option which would mean that the Delta would be within -0.3 and -0.5. A small dip in stock price would have an appreciable effect on premium because of the delta. But why is increase in premium being linked with the fact that it has ample time to expiry? At that point, theta decay rate is low, so the effect of delta on the premium would be more prominent than that by theta. Or am I missing something ? It means the effect of time (theta) is not so much as that of Delta (price movement). In other words, delta has a higher effect on stock prices. Sorry, if I confused you. Its the other way round. i bought call of reliance industries of april expiry . Now there is news about banning f&o trading in reliance industries. Sorry, I dint get your question completely. Anyway, most of the FIIs do transact in options, perhaps to hedge their portfolio positions. I have a confusion regarding 3rd case. Both the positions are short. So in the first leg you lose 7 and in the second let you make 27, net net you make a profit of 20. I wanted to ask on block deals. As an individual I was part of block deal in recent times. executed by my broker. broker individual has to pay service tax to govt. STT is already paid when block deal is closed . I am wondering if you know any process around this or similar process . of paying Service tax . once service tax is paid , I will end up paying capital gain . i am asking if this is normal process or am I in some money laundering scenario. I’m not sure, I’ll probably check with Nithin if is he aware of this. The volatility will tend to shoot up before result announcement. So I’d suggest you look into this. 1.can we buy before WK both PE and CE then sell on sell when IV shoots up and same time place short straddle so it’s more profit. 2) No idea, you will have to scan the market for this. Sorry, can you please explain in more detail? Thanks. 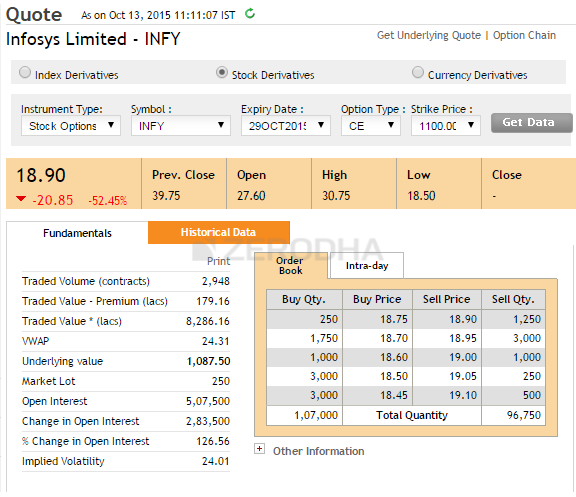 Pl refer trade of infosy Q2 result in options. The trade was executed on 8th Oct’15 and the result was on 12th Oct’15. The trade was taken 3 days in advance. On removing Saturday and Sunday, we can say trade was initiated 1 day in advance. My question is that Implied Volatality increases as coming near to event(result declaration). But in present scenerio it was taken one day in advance. So is it advisable to take trade on one day in advance or to take nearby even declaration day (when IV will still go higher) ? Yes, in such situation, the impact of IV will last upto the time when the event;s outcome unfolds. As before.Because sometimes we can not explains problems only in words. You can always upload this on Google drive and share the link, Ankit. sir , i want to know whether brokerage on option equity is 20 per order or 20 per lot ? if i order 5 lot in same order whether i have to pay 20 rs. or 100 rs. Hi, Karthik! Thanks for everything. My returns have significantly gone up only with 5 modules, one could only imagine what stuff is waiting with the rest of the modules. Let me take this opportunity to ask a small query. As expected, in fact, better than expected, the TCS results were bad. So, I hedged TCS JUL 2450 CE with TCS JUL 2400 PE. The spot went from 2446 to 2396, but along with call, my put options decreased by 3 percent. As the underlying decreased, I was expecting for the premium of PE to increase (Also volatility increased, negligible change in Theta, Rho being constant). But my expectations were just expectations. I would like to know what went wrong with my analysis. Happy to hear this Sudharshan. I hope your returns increases multifold. I guess this was because of the super high volatility premium that went into TCS before the news. As volatility cooled off, so did the premiums. I am trying to do intraday trading in options but for some of the options chart are not showing. is their way to find out which options for a stock we should trade ? for example if stock price 500 , I can see 3 options 480 CE , 510 CE and 540 CE , so which one I should pick for intraday trading. Old CE charts are not opening. It is a standard function excle, Piyush. It should work. so why there was decrease in premium of ITM, ATM, OTM options and it went down? 2) can we say that fall in spot is pushing premium down and increase in vega(volatility) is pushing premium prices up? 2) Possible, depends on the strike and spot rates as well. Comments section seems to be working fine. No, you cannot exercise the contract anytime you wish, you will have to wait for the expiry. sir,in the first example when the base delta is 0.5 shouldn’t the gamma value be 0 instead of 0.005 because the delta has not changed and gamma is the rate of change in delta wrt to the change in spot. I tried to buy BANKNIFTY03AUG1725100CE 20000 at 0.05 around 3.05pm. Please explain why I could not buy them. Thanks. And learning everything about day trading. These modules are quite helpfule for a beginner like me. Thanks for bringing insights on option trading in layman’s language. Just one queyry , since option call buying & put selling are one (being bullish) and option call selling and put buying(Bearish) are also same directionally, what happens to premium in case of put selling? Say , I sold a put for a premium of Rs.50 and if spot increases , premium will go down or up? Similar if I sell a call, premium will go in which direction if spot price goes up? If you sold a Put and the spot price increases, then the premium will go down and hence you tend to make money. In the case of calls, the premium will increase and you will lose money. in above module, there is daily average of 0.04% . how u calculate tthat . is it average of last one year daily return values ? As we can see the daily returns are clearly distributed normally. I’ve calculated the average and standard deviation for this distribution (in case you are wondering how to calculate the same, please do refer to the previous chapter). Remember to calculate these values we need to calculate the log daily returns. Have discussed the daily average calculation earlier in the module. No, the idea is to find out the variation from the averages….for which you will have to add and subtract and not really multiply. Why there is so less liquidity in put options of stocks as compared to call options, barring few stocks. 1) Is put writing riskier than call writing due to panic selling. 2) Many naive traders deal in options and they only understand call options. OR there could be any any other reason??? It is because our markets are shallow. Participation is not much. Hopefully, it should improve over time. I am not able to download module 5.2 which is options theory for profesional trading in pdf. Plz help me. This will be updated next week. First of all Hats off to Zerodha :). Doing fab work. Just want to check is there any issue with Module 5 & 9 because Module 5 & 9 don’t have Download PDF link. Thanks for the kind words, Piyas. Module 9 is work in progress. PDF will be up once it’s completed. Module 5 PDF will be up later this week. Have seen options with high IV as much as touching 40 just before the results day, however at the time the results are announced, the numbers change rapidly, why is the reason for that. Is it wise to always initiate a short strangle or like just before results day. Yes, 40% IV is fairly common in options markets. IVs tend to shoot up whenever announcements are expected. then if the spot price moves to 297. The difference is (297- 290) 7, after reducing the paid premium value, 2rs is profit. Question 1: The intrensic value increase upto 7 difference if delta value is 1 only, am I right? or at the time of excersice this method will be considered. 2: As this is near ATM option, premium will increase 0.5 (delta approximately) per underlying value. Hence the premium will be (297-285=12) 12*0.5= 6, the total premium value is 5 + 6 = 11. will i get profit of 6rs if i square off? I read complete option chapters (Chapter 4) but the confusion here is the premium will increase in the rate of delta (0 to 1) when underlying moving in the expected direction or as calculated in this method (long buy option: intrensic = spot- strike, profit/ loss= intrensic – premium). As per this method until the underlying move above to breakeven/ breakdown point, no profit. In CEAT India case, though the spot price was not even gone below Rs.1220/-, the premium increased (might be of delta, volatility), the client was able to make profit. Is this a difference between excersice and square off or I misunderstood the concept. In Ceat case, the profits rolled due to Volatility. Remember, the premium is a function of multiple factors and not just Delta. I understand now. Thank you for varsity. you have clarified the concept nicely. Thanks. 1. What should be the stop loss for nifty index option trading? 2. Should it be based on the index S&R or should it be a fixed % like say 30% based on the traders preference? 3. Are there any standard stop loss that needs to be followed for trading nifty 50 index? Thanks for such wonderful and simple introduction to options. I am bit confused with the Margins wrt to options. I felt margins in Futures are straight forward. I am little bit confused when it comes to options. Assume I write NIFTY 10200 CE SEP 2017 option 4 days before expiry when Spot is trading at say 9960. Margin requirement is 46000/- . Now by chance due to some very good news nifty moves drastically to 10150 there by increasing the premium sharply( this is an hypothetical situation). How will this effect my margin money which is locked in trading account. Will the broker deduct amount during the trading session or only after closer of market. My main doubt is how and when my margin vanishes assuming a black swan event. Will it happen when session is still live or after opening of next session. If you have written options then margins gets blocked. Now if the position starts to move against you, the margin requirement also increases. This increased margin will take from you during market hours. wat r the cheaper and costlter values for volatility ……………. If you are talking about Nifty, then I’d consider anything more than 25 as high vol and anything below 12 as low vol. Great material Karthik. Just finished reading all 23 chapters. Hope to apply the logic in my trading activities. Happy learning, Akash! Good luck. I guess sticking to the general guidelines would help. You can always calibrate your trades once gain more confidence trading options. Why don’t you add 1 calendar on kite wall for consecutive 20 trading sessions? It will help us lot. How does the premium of a stock’s call option change when there is spin-off/demerger of that company. Suppose i buy a 1000 CE of XYZ (exp. 25 January18) when spot is currently trading at 980 for let’s say Rs. 15. Now, XYZ announces that it’s doing a spin-off of its ABC subsidiary and each shareholder of XYZ gets 0.2 shares of ABC upon demerger. The demerger happens on 15 December. Now, on the expiry date (25 jan18), XYZ is trading at 800 and ABC is trading at 300. Since, i bought the call option before the demerger, my option’s intrinsic value should be 100 [ spot(XYZ+ABC) – 1000 CE] and my premium should shoot up in value? Am i correct? Is this how it will pan out or am i missing something? Ah, this is a little tricky Subir. In such cases, the exchange itself will provide a circular on how the contracts would change. Thanks Karthik. Where can i find such information? Will the exchange provide information after the demerger? Do you know of any previous instances where this happened and what happened to the premiums? The best thing about zerodha is that they have created their customers by spreading knowledge regarding stock market . again a special thanks to karthik sir for providing such great module on options. Thank you so much for such an enlightening article. I am on the verge to getting started with trading.Do you think it is better to start off with spot stock trading instead of futures and options? Yes, always better that way. Good luck, Nidhi. Stay profitable. Is it possible to to add a trade with combination of LONG PUT / SHORT PUT (or) LONG CALL / SHORT CALL..
excellent work sir . i don’t know how to express my joy after studying your module on options. great work. thank you once again for this highly educative work sir . Hope you continue to like the content. Happy learning! I enjoyed all your modules and I have been trading for the last 1 year. My question is about the “bids and offers in premiums”. Why is that I can’t sell at the price I want to. Why is the actual price I sell is different from the market price. My friends who trade through HDFC securities told me that they have never faced this issue. Please do enlighten me. Thank you. Well, I suspect you are placing a market order while placing orders and your friend are probably placing a limit order. When you place a limit order, you will transact at the price you want. When you place a market order, you will get the price prevailing in the market. I’d suggest you always place a limit order. Thanks for the reply. Well When I place a limit order and the premium price doesn’t touch that price. For example I have placed the trigger price at 38 and the CMP is around 36 and the price directly jumps to 40, the order doesn’t get placed at all. Yes, this is quite possible. These are small intraday gaps, where trading does not happen at a particular price, rather jumps that price point to trade higher or lower. This happens especially when there is high volatility. So always track your order for execution, even though its a limit order. Sir, example trade 3 how he made profit?, i think some thing missing in explanation. Because you stated the combined premium is 95 and while square off combined premium is 75. It was a short straddle, hence he made money when the premium dropped. But for 12000CE MARCH 2018 ,The premium were Prev CLOSE=24.55 OPEN=25 HIGH=25.70 CLOSE=22. Could you pls clarify why 12100 Call jumped from 19.20 To 23.05 where as 12000 Call Jumped Only from 25 To 25.7 ? This is purely based on demand and supply dynamics (someone must have traded 12100 CE quite actively that day) – it would be very hard to justify this based on any other variable. If we buy a very Deep CE OTM of far Month NIFTY series(idea here is to minimise DELTA&THETA) , and on a day say VIX is 3% , So Change_In_Option_Premium= OPTION VEGA * VIX , So is it possible that we pocket the Higher Premiums than paid? You cannot minimize Theta, especially when you buy a far month contract. In fact, the longer the time to expiry, the larger is the theta value. I didn’t understand this bit in your question – So is it possible that we pocket the Higher Premiums than paid? Hi, I have not read the whole module yet but i have some general doubts please reply. 1. If i sell Nifty CE of 10850 and premium is 26 rs. and on expiry spot nifty is 10855 then will i be making a profit or loss ? and how will it be calculated? 2. If i buy Nifty CE 10800 premium 42 rs. and on expiry Nifty spot is 10780 and premium is 50 rs. so can i square off my trade and take 50-42 8rs profit ? 3. If i buy Nifty CE 10800 premium 42 rs. and on expiry spot nifty is 10780. then i will have to take 42 loss ?? 4. This might sound dumb but do you have to square off your options trades before/ on expiry ?? 4) I’d prefer to square of my trades, but technically you can leave it open and let it expire. If i let me options expire it means that i am exercising my options correct ? Also, in the third example i am losing 42 rs cuz Nifty is expiring below my strike price… so do i need to square off or no? My broker told me that you will be charged a penalty if you dont square off all your trades on expiry?? I googled it and and there are some STT charges that are debited from the account, so the question is… which trades to sqaure off and which trades to not? Yes, but the option will be exercised only if it has an intrinsic value. Else it will be considered worthless. I’d suggest you square off the position. I’m talking about squaring off the position just before the market close – like 3:20 PM. It does not matter – the option is worthless and even if you square off, you will still make a loss of Rs.42. so if i buy at 40rs and sell at 15 rs wont that mean that i am making a loss despite my option being in the money? This is ITM by 50, I’d suggest you square off before expiry. Sorry, but i cant understand how it will be profitable to square off ? If i am paying 40 rs premium to buy it then why would i sell it at 15 rs premium?? You bought a CE @ 40, strike is 10700. Spot on expiry is 10800. So the option is 100 in the money. But you paid 40 as premium, so net profit will be 100-40 = 60 minus applicable charges. Yes, correct, 100-40 = 60. So even if i square off i will get 60 rs profit right ? Yes, minus the applicable charges. I have a general query, I purchased Auropharma CE 460 feb expiry on 29th Jan. I’m a bit puzzled because I keep getting a statement for my trade every day since the purchase date. Is this how it generally works? This is the margin statement, Emmanuel. Continuing my above query. I purchased Auro Pharma on 29th Jan at CE 30.25, lot 800 @ strike price 640. The premium was around 24200. On 2nd feb i received the margin statement where underlying price was 604 and the net option value is mentioned as -27640. I’m not sure what to make of this. Will i be incurring an additional loss since the underlying is below the strike price? But i understand that the max loss in a call is the premium paid. Can you help me about RMS rejection rule policy especially for Zerodha account holders and it’s circuit limit (already read nse RMS rule policy). I’m having this issue from last week to cont. current trade sessions.I’m not able to figure out because I got same rejection notification when I place order within the limits. RMS rule: Option strike price based on Ltp % for entity A/C-X across exchange across segment product. what is the mean of this in reference of nifty ? for instance If the banknifty price is 26000 around then there is any boundations for which only I can place the orders ? Can you please explain this like other term in varsity ? Is volatility always usually high before results and important announcements? Shoulnt it be the other way round?? So general volatility based strategy is shorting both call and put ATM options and squaring off just before the announcement? 1.) Why volatality is high before any event ? even though price is not changing much, time is same, delta is same. 2.) Why just after announcement volatility decreases very fast, even sometimes price difference is not much ? 1) Becuase nobody knows the out of the event – this causes the volatility to increase. 2) This is becuase the event’s outcome is known, hence more certanity in the market. I would like to know why premium of put option will lose value faster than increase in value of call option when we set up short strangle before an event and out come of that event is positive? This is due to volatility or delta? It’s not really specific to a put option. Can happen with either the put or call, and yes, its because of the drop in volatility. This is by far the best content about options on internet as per me. Great explanation skills. I thoroughly enjoyed reading about options, your extra ordinary narrative skills engaged me throughout and the examples that you gave for every topic made it easier for me to understand!! Supper explanation sir, I read all the chapter and now I am better confident to trade in options. Good luck and all the very best! 2.How to calculate transaction charges (brokerage+STT+transaction charges +GST+SEBI charges) for the options(CALL/PUT) sold initially and expired in OTM? For the 1st case, brokerage and other charges will remain the same, however, STT will be different which you can calculate manually. Remaining charges same means? brokerage 20rs + STT 0.125% on contract value+ transaction charges 0.052% on what intrinsic value? + SEBI charges on what? Delighted to see such a dedicated teacher helping us to learn. Dont you mean “…I believe buying options would before an event….”. No, I meant selling options. We are essentially talking about the rate of decline in premiums, which is beneficial for option sellers. If I’ve bought 3 lots of Nifty and I want to close position of only 1 lot, then on Kite, I’ll press on the ‘Option -> Exit’ option and when the quantity option comes, change the 225 to 75, that’ll do it right? After that, only 2 lots of Nifty will be open? Sir what is the meaning of a naked trade ? Any position which is unhedged and exposed to the directional risk of the market is referred to as a naked trade. For example, buying Nifty futures is a naked long position. If the market goes down (directional risk), then you lose money. However, buying nifty futures and also buying a Nifty Put option is hedged and therefore not considered naked. I did some screw up 2 days back(lost ~5K) due a very bad, pure instinct driven foolish option trade due to euphoria from Thursday results and news on TCS. It was my first trade and personally consider it as my drishti(I hope you know what is drishti 🙂 it is a tamil word). Tried my hands yesterday while I was close to mid-way through the varsity material with what I thought was logical :)) – It was a nice experience end to end – your chapters where the greeks that slowly and incrementally affected my decisions and turned it a good trade. I thought TCS performance day over the day on 23rd April was not really warranted (the dip part) – so decided to enter into OTM call on 24th morning. TCSAPR3450CE, spot @ 3403 : close to deep OTM – the day went on to be quite bad – was -2500 at close of play, spot was @ 3385. I thought it was a flaggish formation – but not really strong since the previous rally was on for less than a week. I was still bullish (the put call ration at close of play yesterday was ~0.3) – I just hoped a morning rally to transition from OTM to ATM and exit at say 28 or so premium. NOTE: I finished reading the whole material first by end of yesterday – revised it once today morning between 0900 and 1100 :). The rally happened as I expected and I could see bulls were clearly keeping hold. As the option travered to ATM, I had finished the full material and I verified the new greeks you discussed. I saw 2SD levels for TCS at around 3475 range and considering spot was already at 3450 range, I revised target to 36 and as the rally kept going on, but I exitted at 37 since I felt ~2.7%(3475 levels of spot price) gain from previous close was dangerously close to 2SD (with 96% confidence I turned a little bearish :)) – I think it was lucky still. The next trade was a good grab : Keeping volatility in perspective(spot close to 2SD range mid-day with strong rally from morning) and considering the expiry is tomorrow and time value running to zero, I went long on TCSAPR3450PE at 18.75 premium when spot was at 3475 again today. The rally happened just as expected and my idea was to make use of delta accelaration at around ATM levels and target placed was 30 initially and revised it and closed it at 36!! I just would request like you to analyse this trade and share your perspective on this. I’ll make notes and use them for future. PS: Before you write it, I will avoid naked directional calls in future 🙂 I am in the process of building my overall strategy for trades, I actually dont know where to start and am writing down everything I am thinking (hoping to give a structure soon). Your inputs will be very helpful! I’m assuming you are new to trading, if true, then I think this is a fantastic approach to the trade! Yes Karthik, It was my second trade. Retrospectively going was the put call seems more risky, thought it went my way. I was still planning to hold it only till it touched 1sd level – is this right from your experience? Apparantly all would have been lost if i held the put right now plus i would have made 3x if i held the ce.. what do you think? Retrospectively thinking, going long on the 3450 put call seems more risky, thought it went my way. I was still planning to hold it only till it touched 1sd level which in my view was safe risk (the price dropped briefly but quite fast as you rightly discussed about fear factor & prices) – is this position right from your experience? Apparently all would have been lost if i held the put right now plus I would have made 3x if i held the CE option right now. As the rally touched 3465, my point on time decay was wrong in the sense I actually went long. But the thought process was since time factor is very less and any additional increase in price is quite less likely(considering 2SD levels), I thought any further upmove will be tested and bears will try pulling down. 1. Was my call to buy PE option keeping volatility, potential price drop to atleast 1SD levels (or ~3445 where my OTM would become ATM) in mind correct? I expected that premium would in fact increase faster at any dip owning to fear of potential drop down close to expiry & fear of losing overall value of call options (with time closing in) : is it a right observation? Arun, like I mentioned in my previous comment, the only problem with SD-based targets and SL is that they react quite late to drastic price movements. However, in your case, I think the volatility has played a crucial role. The rate at which the CE dropped versus the rate at which the PE gained was quite expected. By the way, the effect of theta can realistically be experienced only where there two days to expiry. Yes, demand supply plays a big role, unfortunately, there is metric to capture this. An indirect way to assess this would be only the spot vis S&R. 1) Generally speaking, you would not want to buy options when vol is high. But yes, major dips increases the volatility. So in a sense, your logic is bang on the buck. Ideally, you should hold until 1SD, but please do watch out for extreme price movements. This can skew the SD levels. Any other good reads from your view Karthik? For volatility based option trades, one utilises the overall volatility (India VIX) at the moment, rt? 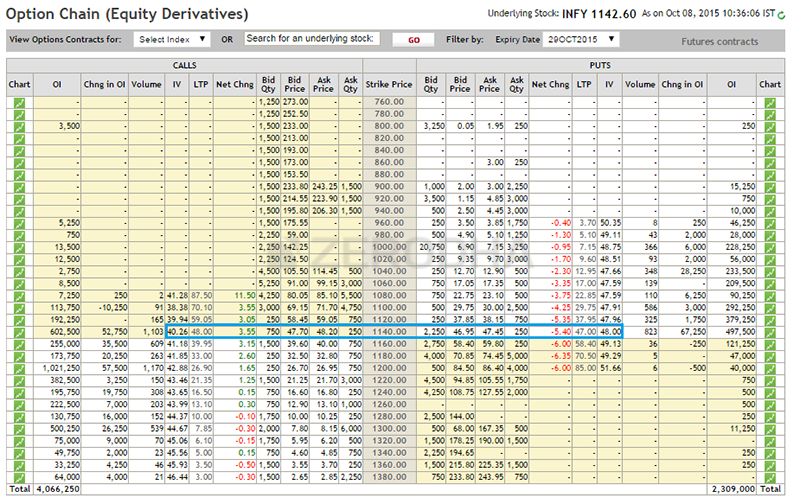 So, where does one exactly use the Implied Volatility mentioned for each Nifty options contract on NSE site? These IVs can be used to figure out which strikes are trading at higher vols. You can even compare this to historical volatility. I am new to Options & just finished reading this chapter. Just few silly Questions one by one I may throw here for clarity. 1. As you mentioned, if a stock is at say Rs. 420 & I expect it to go up in next week, so I buy an nearest OTM CE say ~430 Rs. at some premium. Now there are few things I noticed – A Scenario just next day. b. Spot Price may be 430 Rs. 1. Very high in case a.
I am ignoring news (So Volatility is ignored), I am ignoring time value as it is just next day, I am ignoring sharp move in delta & gamma variations due to just next OTM strike. Now My next observation is that suppose if I buy 440 CE at Spot of Rs. 420 at some premium say Rs. x. This is for the current month expiry. So now if spot is in uptrend & I hold it & when price moves up beyond 440+, the premium goes very high, But demand may not be there beyond a limit. The liquidity maybe low, you need to place an offer and hope to get filled. 2. To square off the position at higher premium. I expect that due to delta being lesser than 1 always, premium can never move faster than underlying. So Change in premium can not increase by Rs. 20 ( 460 – 440 ). Hence, it will be better to go for option-1. If So, how we do it in the system. I mean, as mentioned they are cash settled, I am not clear how to do it in the system. Can U refer any U-tube link or video / pic? If you are happy with the gains, then you can certainly square off. If you think it is going much beyond 460, then stay on. Really depends on your risk appetite here. There is nothing special that you need to do for square off, you just need to keep the position open and let it expire and its deemed exercised. But please note, if you leave an ITM option to expire, you may end up paying a large STT on it. Your explanation in all module seems very well for us, Thank you very very much. Keep it up. What will happen or what will be procedure if one wants to take delivery of the Infosys stock on expiry. In our current case study consider example of fundamental analysis of Infosys, here we don’t want to square off the premium we want the delivery of stocks. Kunal, delivery of shares has nothing to do with F&O expiry. Hello Sir, yesterday was my first options trade, asian paints did fundamental analysis, did a lot of ground work and bought slightly OTM, deep OTM options CE and hedged it with PE(added up delta) , yet I am not convinced about my desicion, since it was my first trade(couldn’t sleep actually). Today closed the position with 20% profit sir, completely forgot about gamma, so sold minutes before it reached 85 – 100%, Lesson learnt. But very happy that my process was a success, I thank varsity for giving necessary tools. Good luck, Mani. Hope more (and bigger) success comes your way! How do you manage your trading time sir? I am very sure that you cannot sit in front of a monitor all day long since you are involved in many activities, so when you do your analysis, trading decisions etc for short term and long term strategies. How you keep yourself less cluttered? Because I find it quite challenging managing a traditional business, family time, trading aspirations and my hobbies. Is there any thumb rule or special recipe that you follow sir? Fine ?. I have a doubt in option selling sir. For example I sell TATASTEEL 800CE for 80, lot size 1000 thinking that spot prize won’t go beyond 800. So my brokerage for sell side will be calculated for 1000*800. If the trade goes against me and I decide to get out of the trade before expiry then what will be my loss? and how my buy side brokerage will be calculated sir? The brokerage if you are trading with us is 20 for each site and nothing else. You can exit the option anytime you want, no need to wait till expiry. thanks for replying sir, I think I was not clear with my question, anyway got my answer from a discussion in tradingqna forum. Request you to provide notes on price action / advance price action. How does same work in live market. When we see news channel they show OI and predict what will happen in cash market means indirectly they are saying that spot price depends on option OI. Which means don’t you think people having big positions can manipulate market at least on the day of expiry by doing short sell or buying intraday to get benefit from option. These are just predictions, as good as your or my guess. Manipulating stocks/indices with high liquidity is not possible. But I do think stocks with low liquidity can be tampered with. I want to buy an option say Bajaj Finance Strike price 100 Premium 10. I wanted to put a stop loss at 9.50 and book at 11.50. How should I put these figures on the trading terminal. Once you buy the option, you can place a SL sell and buy orders simultaneously. Make sure you cancel one of the orders when one of the order gets executed. What your are saying is that If I want to buy /sell an option. I have to place stop loss on both sides of trades simultaneously. As I have never traded options before so if you could send me a screen shot or something. Here is what I’d suggest you do Ajay – buy 1 lot of Nifty Options and sell the same after few minutes. You may make a loss or a profit, but that is not the point, it will help you understand the process better. Thank you . I did it today. I understood it. Good luck and all the very best, Ajay! I am trying a delta neutral strategy by buying a Future and Selling 1 ITM CE and 1 OTM CE, my query if the nifty moves beyond the expected range (sweet spot) when and what adjustments are required to keep it profitable? In the nifty option chain the change in OI varies aftet every few mins, so can we take this change as almost real time data ? I am new to options but have grasped the concepts going through your lessons. He buys 7800 CE at 203 and 7800 PE and 176 (Total is 379). Then Premium for CE reduces to 191 and for PE it increase to 178 (Total is 369). He has lost 10 points right ? He loses 12 points on CE and gains 2 points on PE, so net 10 points loss. If you add the P&L from the two options, you will note that its a 10 point profit. Add them up individually. Thank you so much for the efforts you have put it, i believe it has changed my perception in understanding options. pls go through once to the below link, i have tried a lot put a lot effort to bring alltogether. just wanted you to review once. This looks quite comprehensive, Mohit. Great job! i wish if you could through the sheet once (shared below with link ). would like you to review and comment for any of ur suggestions if m missing anything. Like I mentioned Mohit, this is a very comprehensive sheet, gives you a first-hand info on most of the things related to options. Good luck! 1) We are short straddle and What if earning is declared after market hours, next day stock opens with gap up? 3) Who provides Implied volatility chart for stocks and index? is it available in Zerodha PI? 4) I’d prefer shorting one for reasons mentioned in this chapter. Nikunj – if you expect the bounce back to be sharp and immediate, then I’d think futures is a bet. Else, I’d be happy to buy ATM calls or maybe even a bullish spread. I read through this recently (Aug 2018). I have read several other books including the one by Hull, viewed countless videos . I must sincerely record this intro was very effective . Perhaps my prior exposure helped but I found reading this far more interesting than many other tutorials . Great effort and thank you . Sir, I have purchased ITC CE options today at 5.14 premium with strike price at 310, since I am new to options I want to know when will be the best time to sell this. how does nse measure implide voaltilty which it produces in option chain. Please tell me something about sgx nifty and how can i use it to my benefit. Also whats its timing in Indian standard time. SGX Nifty is Nifty listed in Singapore. The only way to take advantage is by tracking where Nifty is likely to open by looking at SGX Nifty. okay thankyou. But whats the reason that nifty opens with conjuntion with sgx nifty. i think that opening prices are determined by the bids and offers of traders which starts from 9 am so why does nifty matches its opening with sgx nifty. The opening is never exact, but what matches is the direction of opening. Is there any way in which we could manually calculate wheightage average of last hours of trading which would help us to determine the probable closing price for that day which is good to know when trading option in expiry day i think. You certainly can do that, Ricky. I am new to options..
Do we buy lots by the premium amount? If premiim is 46 to buy 2000 lots it costs 2000×46?? Yup, that’s how much you’d pay. Derin, its based on the change in premium. I’d suggest you read through this module once (including comments) to get a grip on Options Trading. Good luck, hope you stay profitable! Why put option premium losses value faster than the speed at which call option premium gain value? Thanks for your great effort to educate people. This is a specific example but in general, this is due to the decline in volatility. First of all, a sincere thank you. Varsity is a blessing in disguise for everyone out there who is curious about finance. Really, god bless you for such work! The knowledge here is truly priceless because of it’s simplicity, and really, a big thank you to you and Zerodha team for this gift to us dummies. I have a minor query regarding options, and it may sound completely stupid. Please bear with me since I’m from a non financial background. It is understood why companies list themselves on the exchange. Because it helps raise money, because management itself is a shareholder, and it helps in mergers, etc, but what gain does a company as a business entity have by providing an arrangement for traders to trade options? Since it is a zero sum game, I guess company management or owners gain nothing through it, so what is the incentive for them to make provision for options trading under their banner? Also, I have been through options strategies on varsity. Can you please suggest some good reading/video material for further study? Great explanation on all the topics with analogies. It makes me feel to read them all over again to appreciate the beauty of how options are explained. is it legal to trade in derivatives from loan money from bank or private moneylenders or friends etc. As a broker, all one would check is if the money is coming in from a registered bank account. The broker would not be liable to check the sources of funds. you got me wrong. I am not asking from brokers point of view. when i was studying the loan policy for personal loan in sbi it was mentioned could be used for any purpose other then speculative one therefore i am in doubt , Also i think trading in derivatives does not consider as speculation business. Ah, is this a loan against share that you are talking about? Hello Sir, first thank you, varsity helped me a lot to fall in love with options. Mani, I’ve shared the list across a few chapters (as and when relevant). In the ceat case study how did he close his position? Does he has to “sell” that option or transfer it to someone for the difference in premium? I know it must be the latter but sorry if you can guide me as to how to close one’s position(as in did I miss anything on varsity)? And what are the possible ways in which one can close his long call/put and short call/put positions? It is just a normal sell order, which will square off the position, Pranav. lead to a good increase in option premium”. Can you please explain me why this happen….i think i read this somewhere in this module but cant found it now….Plz sir explain this. Hello…sir….I am still waiting for the reply….Thank you. Don’t know how I missed this. I was trying to imply that when there is ample time to expiry, the Delta plays an important role. can anyone tell me why ATM strike has less impact cost?? Thank you for the amazing information, really appreciate it. I have a question regarding an option that I bought (Buy to open ) a put trade ATM, I was betting that the price will go down. After I did the transaction, they announced that the company will be purchased by another company. The expiration date is not until November 19th. My question is: is there any benefit to keep the transaction until they finalize the deal (As an option holder not a stock holder)? The price is not moving in any direction since everyone is waiting. Hmm, the outcome really depends on how things pan out, and as you can imagine there are many possible outcomes based on the terms of the buyout. Speculating on it now can be futile. Hello Sir, I am trading using kite python api, how to calculate margins for naked option writing and also for margin for overall position. I did sir, it was helpful thank you. 1140 CE was trading at 48/-, implied volatility was at 40.26%. The 1140 PE was trading at 47/- and the implied volatility was at 48%. According to volatility basis, it is logical to sell both call and put option when volatility is high especially when a major event is right around the corner. Now volatility decreased for the above scenario. So now Premium has to decrease right for both call and put option. But it is not in this case. Why? The effect can be noticed right after the announcement, this is when the premium drops. Eventually, the direction will be set by the actual outcome and from then on Delta takes over and the premium starts to move in the direction of the stock. Could you please suggest how is Margin and premium adjusted for a short position which is held for couple of days, since i believe Options does not have MTM settlement in cash like futures, but then how is the net profit and loss calculated? is it on daily basis deducted and added from margin? Once you initiate a short position, you receive the premium in your account as soon as you take the trade. So the maximum profit you make is already in your account. There is no MTM settlement like futures, only the margin remains blocked for the trade as long as you hold the position. If the premium(or volatility) increases, the margins for the position is increased. Margins are updated by the exchange 4 times during market hours and once at the end of the day. i have bought options for IDBI bank (CMP 59) . IDBI is trading in the range of 58 to 60 for the last 10 days. So IV is decreased & IV was around 25-28 when i bought the option. 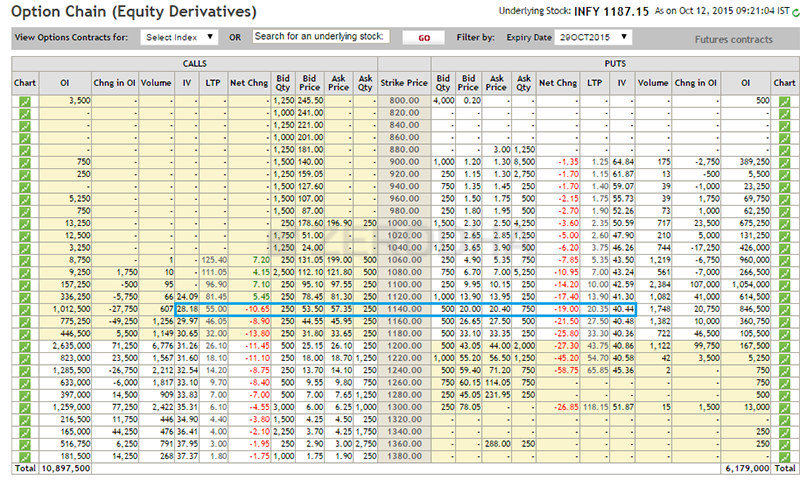 I bought the options because as per volatality cone Mean IV was around 45% and SD -1 IV was 28% with 30days to expiry. 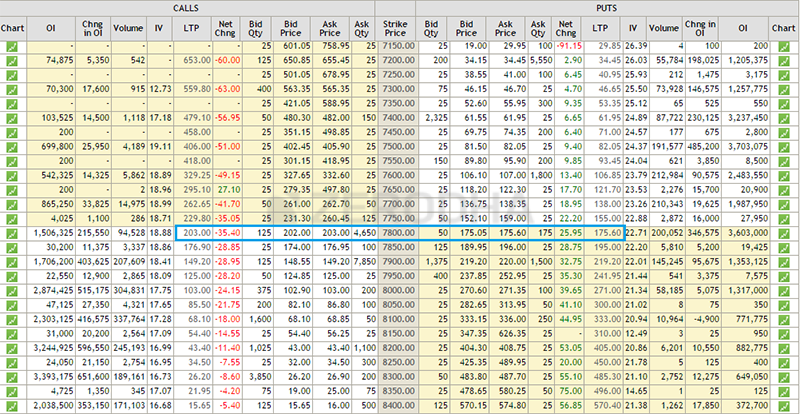 I could not wait for options IV to reach SD-2 levels because it is rare oppurtunity to see IDBI options IV @10%. Hence I bought [email protected]/- and 57.5PE @ 0.8/- . My breakeven point is 2.4. With 30days to expiry is it a good bet to wait for the breakeven point? Please suggest if anything is wrong in it. Or else tell me when is the best time to buy options in the above mentioned strategy. Previously i tried this stratergy on HDFC,HDFCBANK, YESBANK and LUPIN ( at that time i did not know anything about options basics), i tried it just by fluke (without bothering about IV) and it clicked for all stocks. Also what shall be my stop loss for such trades. Because i failed in this strategy for IDBI ( OCT2018 series) ; bought 57.5PE and 60CE with 15days to expiry & unfortunately none of the options managed for ITM. Buying the option when the volatility is low and when there is ample time to expiry is the right thing. The only thing that can mess up the trade is the delta. Can we know exact timing when the quarterly result of stock will be out for example lets say yesbank result will come out 25 october which is declared but wheather it is possible to know the time or the result could be declared any time on that day. Companies don’t follow a yearly calendar, Prakhar. So this may not be possible. I really appreciate the sincere efforts you put all along explaining these complex terms and concepts of market. For me, after reading this only I came to know all about this. earlier my thinking about market is gambling only. Thanks a lot again for sharing. Bharat, I’m happy to note that. 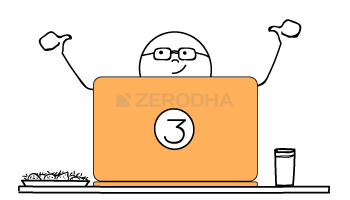 Hope you continue to find more value from Zerodha Varsity! Before buying an option ( stock option particularly of top 10 largecaps), OI should be seen to identify its liquidity, but what does ” number of contracts traded mean? Just saw HUL 1680 CE (29/11/2018 expiry), it says OI of just 45000 and number of contracts traded 234. Is that liquid ? OI represents the total number of outstanding contracts in the market, while 234 could be the volume (number of contracts). Btw, it is not really liquid enough, Varun. What should be OI ideally for a stock to be called LIQUID? i mean should that be in lacs or how much ? 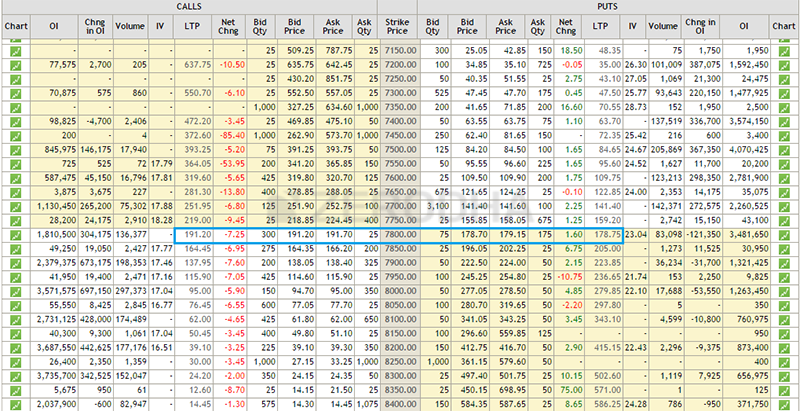 …..Because i don’t see that much OI in stock options as in nifty and bank nifty options. Further, do these top blue chip companies show Liquidity near to their quarterly results ? Varun, OI is not a great measure of liquidity. When you try to estimate liquidity, you essentially check how easy or difficult it is to buy/sell the stock. For this, you need to look at the volumes traded. Nifty has crazy volumes…for single stocks, it should be at least a 3rd of Nifty. Myself Shiva a traditional Visual Basic 6.0 and SQL SERVER programmer just finished your tutorials and have automated exactly what your tutorials says. I tried my best. Reason behind the automation is the pain / grief experienced in the market and of course the curiosity behind your tutorials. Program will do all the things explained by you in tutorials with in a seconds. Thought of posting Screen shot but no where i can upload images. You can upload the images on Google drive and share the link. Sir my pleasure you have responded, sir authenticity of the result shown in the images you only can validate nobody else can. My workings on only Nifty options I have not considered BANK NIFTY, STOCKS in it. NIFTY historic data was considered from Dec 2015 to Nov 2018. Delta, Gamma, Theta, Vega and Rho calculation is not the part of the programme which I have written. I considered those things for just knowledge purpose. If needed will incorporate that also, request you to recommend. Sir I am not sure the result is 100% correct, just validate and guide me. Send me your Google e-mail address will upload images. That’s nice, Kumar. As long as it works and fits in within your risk appetite, it should be ok.
You can upload on your own Google drive and share the link here for everyone to see (hope you are ok with that). In essence, you are calculating the range and selecting the strikes, right? Yes you are right i am just calculating the range and selecting strikes, i am just watching the data with the real market and doing corrections in the program may be after someday i will be able to trade with at least 60% confident. Good work sheet.would you mind such sheet for January?.please share how you are doing it step by step with excel sheets.Also share your strategy and trades if it is ok.
Sir something wrong…I posted link 3 to 4 times but not posted. I just approved and replied. Sir could you please explain how ZERODHA is managing with almost no brokerage, because have seen so many brokerage firms has been winded up due to non-profit or other reasons. 1. If something happens to ZERODHA what will happen our scripts in demat. 2. What about the fund which is lying in the demat. 3. Is it safe if we transfer X amount for trading purpose. 4. What about the orders which was executed in between. 5. Is there any standard procedure to follow in such incident. 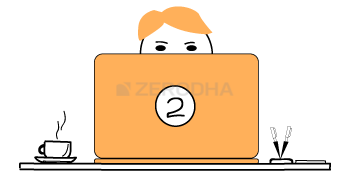 Sir there are many questions to ask…most probably for all the possible queries there will be an answer in your ZERODHA policies, if so please post it here. Sir have created alert using SENTINEL but alert message is alerting me event after a hour or two, our alert purpose and SENTINEL purpose will be defeated if this continues. Request you to look into the same. Your alert KVYES was triggered at 10:50:38 – 28 NOV 2018. Visit Sentinel for more details. This was an error, should have been sorted by now! Thanks for posting the link which contains some appreciable points about ZERODHA as well as other legal points, you have mentioned IL&FS as your partner, recently there was a crisis with the same all knows. Anyway we will have our own strategy to secure our self, not a big fan of any service provider or company. Hope and wish ZERODHA is immortal 🙂 and continue trade with ZERODHA. Hope we can continue to improve ourselves and serve the community better! If i have understood this correctly, because max delta is 1, option premium will always change by a smaller value than the change in the underlying, unless it is deep ITM option. So, if i have a strong directional view, why not directly trade the underlying and capture the complete breadth of change than the relatively smaller change in option premium. I see a case for trading options only if i don’t have a strong directional view and the play is on volatility or theta decay. Its not just about having a directional view, Akshay. There is the angle of time as well. So the question is what is your directional view and by when do you foresee that panning out…this needs to be answered. I have not factored in impact of volatility in both the cases, but the point is, whatever the case is, profit from CE will always be less than Rs 50. So what is the point of buying options? I think I got the answer – CE won’t block any margins, so I can buy more options than I can buy futures, and hence can make more absolute profits. Am I correct? Akshay, futures requires a much higher amount of money in terms of margin blocked. So in place of 1 Fut lot, you can probably buy 3-5 lots of Options. This impacts your ROI a great deal. E.g. Amt in account = 5 L, At max leverage, 700 Currency futures can be bought, 1400 ATM options can be bought. Delta for futures is 1, delta for options is 0.5. Net payoff is same for both. Infact payoff for options buying tends to be lower because of volatility impact, theta decay, impact costs due to higher spreads, and higher transaction charges than currency futures. Did I miss anything, or am I wrong anywhere. Please guide. I’ve kind of explained that in this and the previous chapter. Thanks for providing essential knowledge about option theories. Its very detailed and complete in itself. However I want to ask your opinion about intraday trading in Nifty only. What according to you is good, buying/selling Nifty options or buying/selling Nifty futures if you want small but consistent profit ..? I just want your opinion as you are well experienced in stock market. Sooraj, if its intraday, I’d suggest Futures. Thanks for sharing your opinion…!! Pleasure, Sooraj. Good luck and all the very best. Thanks a lot for giving good perspective on options.If it is one weeks duration do you suggest going with options?Is it simpler to focus and sell options only and in Nifty and Bank nifty only.if I am looking for say 14k per week what is the capital required?Please suggest some strategy to achieve it.I want to only sell options.Can you add one chapter only on selling options and hedging risks.This would be very useful for retired people who can write against securities,FDs,Mutual funds etc.what are shares on which Zerodha provides margins and how much? Thanks again.You are very good in explaining complicated subject like this.You add latest case studies.Also readers may be encouraged to share their experiences. Happy to note that, Sir. Assuming the premium is about 12 and the margin is about 60K, you will need to write about 15 lots to make about 14K per week, this is roughly about 9-10L. I will add a chapter on Options selling sometime soon. At present we dont have a pledge against MF, hopefully, that should happen soon. I had a question.. Suppose if I short Titan 1000CE at 10.5 and wait for expiry date and if no buyer available what will happen to my trade.. assume Titan will end price of Rs 995/-.. The 1000CE will be worthless, hence you will get to retain the entire premium. Hello. I’d been trading only on Nifty 50 till now and wanted to start with Bank Nifty. a) I understand that there’s a restriction on buying OTM options on Zerodha. But we can still sell OTM/deep OTM calls/puts? b) If I do sell OTM Bank Nifty puts (for e.g. ), and they are giving me profit on expiry, then like Nifty 50, I can let it expire & not square off? Milind, there is range restriction for selling OTM options. If its OTM, then you can just let it expiry without any worry. Say, I’ve executed a short straddle for Bank Nifty. Now, if after some time, my position has gone against me & I want to close it, will I be able to do so if it’s now OTM and thus, outside the range which has been prescribed by Zerodha? E.g. Selling 27000 options when Nifty is also at 27000 but wanting to close position when Nifty reaches 27600. Yes, you can close the positions, this is not an issue. Very nice chapter, and very well explained. Kudos to you and the Zerodha team. One small doubt if you can please help to clarify. I trade mainly intraday in Nifty options. For tracking the options movement, i used to see the underlying Nifty index chart. Is that a correct approach? Because some of my trader friends say, they see the futures chart to track the options movement more closely. Thanks for the appreciation, Prince. I’d suggest you continue looking at the Index chart, that makes more sense. I do the same. However, you can’t go too wrong looking at futures chart as well. First of all thanks for such a brilliant initiative. I had a question with regard to the last trade taken by your friend. I completely get the logic behind the trade but what I have learnt from you is that, when trading options, there are two things that have to be on your side. 2. The time in which that logic has to work. I understand that he could sense the overreaction to the bad news, but expecting the market to realise the positive side of the trade within that expiry or timeline and buying a naked option seems a tad too risky. It could have been possible that the positive realisation kicks in a bit later. Pls suggest me when should i take long straddle positions..?? Is it a gud stratergy or do u reommend any changes?? Plz reply…i found varsity to be something useful n simple …hence asking u..plz reply..
Nagaraj, I understand the temptation to go long straddles, but trust me, it is not really the best thing to do. You can go long when volatility is low and is expected to rise, but during results or any corporate events, it is usually the other way round i.e the volatility is high and expected to decline post-event. 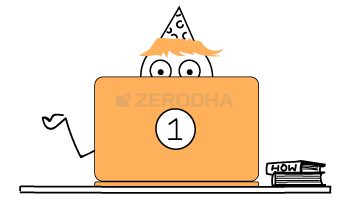 i am a zerodha member for a year now. I wamt to clear a query from you. Good evening sir ji. I am following you and reading @ZerodhaVarsity for a very wrong time. I want to clear the only doubt I got for myself. OI along cannot be used to arrive at a conclusion, Edward. You need to look at this with respect to the price movement, OI variation, and the volumes. Then lets assume that change in OI is large positive and premiums also increases., Then we need to look from buyer’s side. I mean why sometimes we look from sellers perspective amd why sometimes from buyer. I mean one is buying and one is selling. Then whats the difference. I know I am wrong somewhere im grasping the concept. Please correct me where I am wrong. Exactly, Edward. It is hard (and wrong) to attribute the OI as bullish or bearish OI. Therefore the need to look at it from the perspective of the price. Hence, the increase in OI plus the increase in price is bullish and vice versa. I was trading so far with nifty futures on a intraday basis. I didnt care for nifty options becoz it was monthly and its complicated. but Now with the introduction of weekly option I am getting confused because i observed that they are moving fast as compared to monthly options. I feel they are good for intraday trading. I trade only till 12.00pm hence capture morning moves with nifty futures and never trade in afternoon volatilty. Now I am getting tempted to those weekly options. should I trust weekly options for intraday in the morning or continue with nifty futures..? I just want your point of view on this dilema..plz guide me. thanks..!! I forgot to tell that I trade only reversals in nifty futures to capture quick gains…is it possible to apply same in case I buy options..?? Sooraj, if you are profitable and happy with Nifty futures, then stick to it. Why do you want to change or disrupt that flow? End of the day, the color money is the same right? Whether you make money from futures or options, how does it matter? thats what I am thinking..as I am comfortable with nifty futures…I should not look for anything else..but you know since heavy news, articles, videos are coming stating that nifty weekly options are much better even for option buyers…so I got tempted..but I always go for your guidance to clear my confusion..!! Yes, stick to what works for Sooraj. Can you recommend something similar for derivatives trading where people have discussed their trading strategies? Thanks! Unable to think of any, Sachin.